Grammy winner and Rock and Roll Hall of Fame inductee Sting performed in St. Louis Tuesday as he continues to kick off the next leg of his Back to Bass Tour. 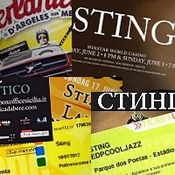 His stop in St. Louis is one of only a handful of shows Sting is performing in the United States before heading back to Europe for the next couple months. The last time Sting appeared in the Gateway City was for a performance with the Royal Philharmonic Orchestra at a sweltering Verizon Wireless Amphitheater two years ago. At that time his concert tilted towards a very subdued nature. This time, with help of a much smaller backing of Dominic Miller on guitar, Vinnie Colauita on drums, David Sancious on keyboards, Peter Tickell on electric fiddle and vocalist Jo Lawry, Sting was able to perform a more up-tempo show. Coming out to 'All This Time' and The Police's standard 'Every Little Thing She Does is Magic' Sting was draped in a solo backlit spotlight for much of the performance while his band was in the shadows, being lit only during the choruses. The stage lighting remained simple throughout most of the show. It wasn't until 'Never Coming Home' that the lighting was used to its full extent, a nice example of appropriate mood lighting. It was apparent lighting wasn't at the forefront for this show as it was clearly focused on the music and Sting's strong vocals. The night was a collective of blues/rock/soul/country and pop. Whatever Sting sings it resonates with a soulful blend of harmony and melody mixed with catchy, thought provoking lyrics. He mixed in a wide ranging set with staples from his solo career (25 years and counting now) and The Police (though, unfortunately the live favorite 'Roxanne' was nowhere to be heard). Some of the more obscure songs were a treat for die-hard Sting fans. 'Heavy Cloud No Rain' was a nice addition to the setlist and enticed a sing-a-long from the crowd. Sting, whose real name is Gordon Sumner for those who don't know, excels at being a storyteller, and in between many songs he would offer up a narrative of the song's meaning or origin. On one occasion he misspoke that Toby Keith had performed his song 'I Hung My Head' then corrected himself by stating it was Johnny Cash. The very next song he vindicated himself by saying that 'I'm So Happy That I Can't Stop Crying' was the song covered by Keith before he preformed it with a style that only Sting could make work. One of the highlights, and there were several, included 'Desert Rose' with its Middle Eastern style pleasantly filling the beautiful Fox Theatre with its mystical beats. Even though Sting himself doesn't do solo on the bass he allowed each member a chance in the spotlight to show off their wares on their respective instruments. Particularly intriguing were the solos by Tickell as he blazingly lit up the stage with his fast and furious fiddle work that had the crowd erupting in appreciation.